Do you blog about peer reviewed research? If so, the recent announcement from BPR3 (Bloggers for Peer-Reviewed Research Reporting) might be of interest to you and potentially increase the readership of your blog. Over the past couple of months there has been a contest to design an icon to identify blog articles that were based on, or were a review of scientific (peer-reviewed) literature. For background information click here. So here are the winning icons, designed by Uriel Klieger. 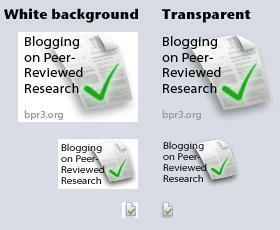 Within a couple of months, BPR3 hope to have an aggregation site of all the uses of the icon. Readers will then be able to either subscribe to the RSS feed or visit the site directly to see what research reporting has been occurring. Also, this icon could potentially play an important role in improving the standards of research reporting. Finally, apart from the prestige of being the winning designer, Uriel is the lucky winner of numerous prizes including a personal subscription to CAB Abstracts. So, from me and on behalf of my colleagues at CABI, we wish to congratulate Uriel on the fantastic design that he produced and taking onboard the final tweaks – well done.